September 8-14, 2014 is Diaper Need Awareness week. This event was started by the National Diaper Bank Network to recognize the diaper gap in America. My friends at Giving Diapers, Giving Hope are part of the solution to diaper need. They’ve helped over 600 families and shipped nearly 11,000 cloth diapers to qualified families for just the cost of shipping since they began in 2011. 2. Cover your return address with your hand or a sticker using an app in your phone. 3. 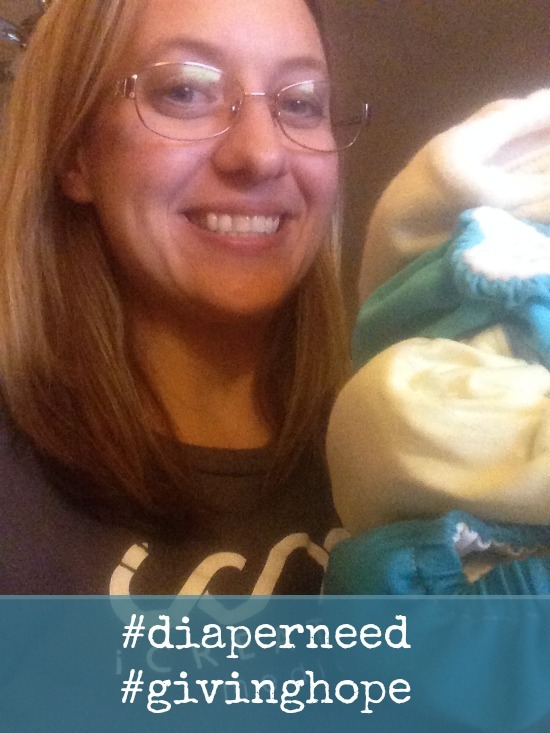 Post to Instagram and include the hashtags #givinghope and #diaperneed. Tag 3 friends. 4. Cross your fingers an elf finds you! As an organization that relies on donations to keep up with the growing demand of families looking to use cloth diapers but who can’t afford that start-up cost, your ONE diaper will add up with the other donations to make a BIG impact! This past July we helped over 40 families and shipped 700+ cloth diapers. August is on target to help over 40 families as well! Every donation counts. To show their appreciation for your donations they will also be randomly selecting some donors who use those hashtags with their photos. Kim, our Executive Director and owner of Dirty Diaper Laundry, and her elves will be performing RAOK (random acts of kindess) to those selected. The RAOK could take the form of new cloth diapers (ahem…. There may be a Spence and Marie in the bag of treats), accessories, or E-Gifts from supporting companies. It is our way of thanking some of those who donate. Please make sure you have made your profile public so that our elves can find you by searching the #givinghope hashtag on Instagram. I have accepted Maria’s challenge and have sent my donation to Giving Diapers, Giving Hope. I tag @JennyMcClamroch, @Tricia17Lee, and @SaussyNicholas to take the challenge! I can’t wait to see your pictures on Instagram! During Diaper Need Awareness week you can also support Giving Diapers, Giving Hope by purchasing items from Super Undies and Eco Nuts who will have a Buy One/Giving One matching promotion. Photos must be posted during Diaper Need Awareness week, September 8-16.